A curriculum of 16 projects designed to help moms teach their children how to sew. 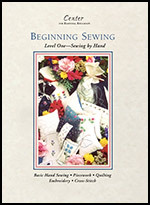 Begins at the simplest level with a pincushion and includes an introduction to hand sewing, embroidery, quilting, piecework and counted cross-stitch. For ages 5 and up. Kit includes: pre-cut 100% cotton fabric to make all 16 projects, polyester filling, embroidery floss, ribbon and Beginning Sewing, a 26-page spiral-bound book of illustrated instructions.